THE TOYOTA IQ IS A STYLISH, LOW-COST, HIGH QUALITY CITY CAR WITH A DIFFERENCE. ITS THE SMALLEST SMALL FOUR SEATER CAR IN THE UK. DESPITE BEING LESS THAN 3 METERS LONG, ITS BRIMMING WITH SPACE SAVING TRICKS AND THE CABIN IS DECEPTIVELY ROOMY, PARTICULARLY FOR THE FRONT PASSENGERS. MUCH OF THIS CARS APPEAL IS ITS LOW RUNNING COSTS, QUIRKY LOOKS, DECENT DRIVE AND OF COURSE TOYOTA'S BULLETPROOF RELIABILITY. 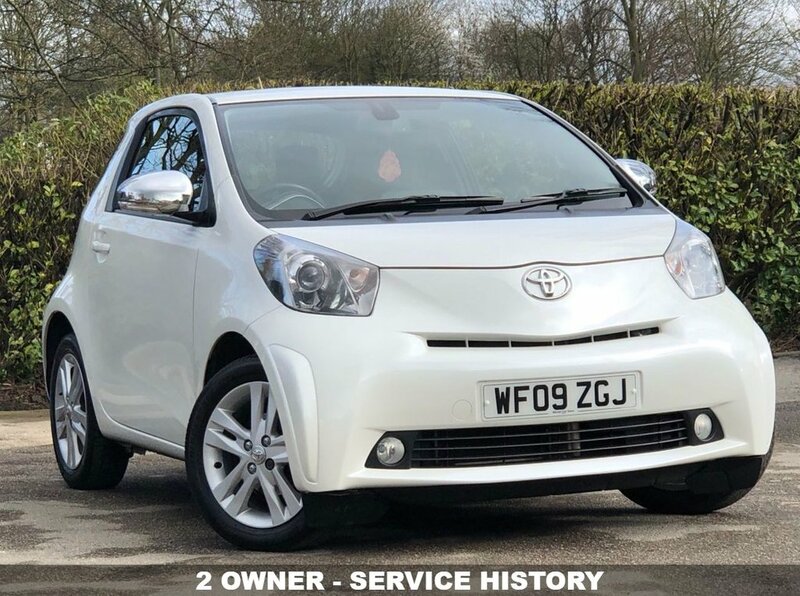 THIS 2 OWNER LOW MILEAGE VEHICLE WE HAVE ON SALE IS IN STUNNING CONDITION INSIDE AND OUT AND HAS BEEN MAINTAINED WITH SERVICE HISTORY CONSISTING OF 5 SERVICES THE LAST DONE AT 31502 MILES ON THE 11/10/2017. FEATURES OF THIS CAR INCLUDE AIR CONDITIONING/CLIMATE CONTROL, RADIO/CD WITH MP3 COMPATIBILITY AND KEY-LESS ENTRY AND START. THANKS TO THE STOP/START TECHNOLOGY FITTED TO THIS VEHICLE WHICH NOT ONLY HELPS REDUCE EMISSIONS MAKING ROAD TAX JUST £30 IT IMPROVES ECONOMY MANAGING TO ACHIEVE AN IMPRESSIVE 67 MPG. THIS CAR WILL COME WITH A FULL MOT, SERVICE, WARRANTY AND 1 YEAR AA ROADSIDE.